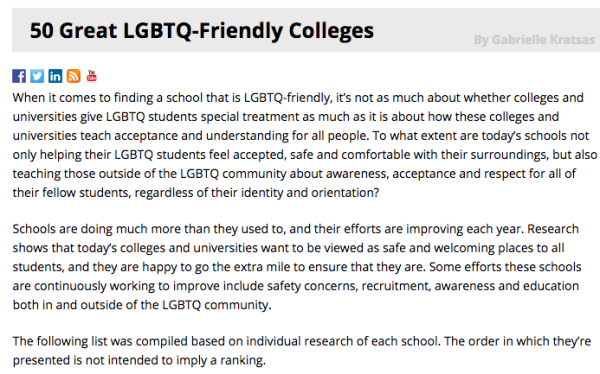 When it comes to finding a school that is LGBTQ-friendly, it’s not as much about whether colleges and universities give LGBTQ students special treatment as much as it is about how these colleges and universities teach acceptance and understanding for all people. 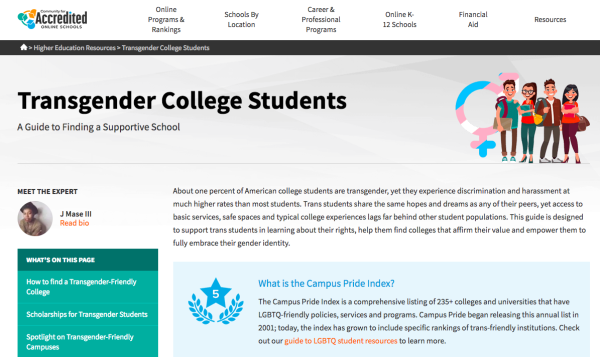 To what extent are today’s schools not only helping their LGBTQ students feel accepted, safe and comfortable with their surroundings, but also teaching those outside of the LGBTQ community about awareness, acceptance and respect for all of their fellow students, regardless of their identity and orientation? 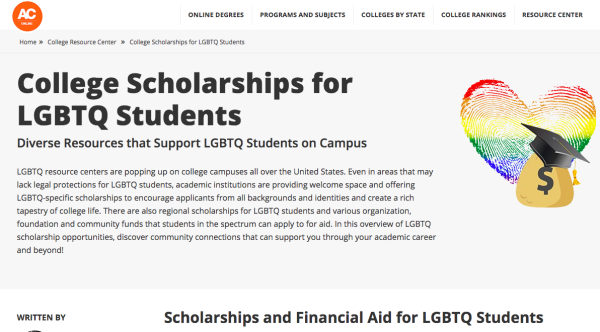 Many organizations and foundations offer scholarship awards specifically for LGBTQIA students to ensure lesbian, gay, bisexual, transgender, queer/questioning, intersex and asexual students have the opportunity to pursue higher education. But these scholarships also empower students and foster equality on college campuses across the country. 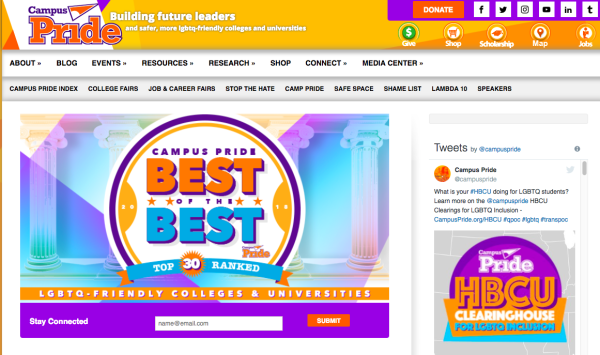 Find scholarships for LGBTQIA students and allies and get expert tips on how to increase your chances of winning an award. 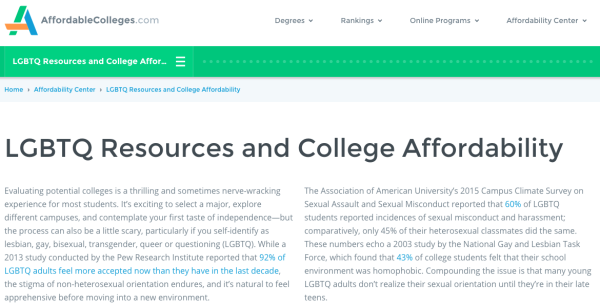 Access information for LGBTQIA+ students who are iterested in post secondary options. 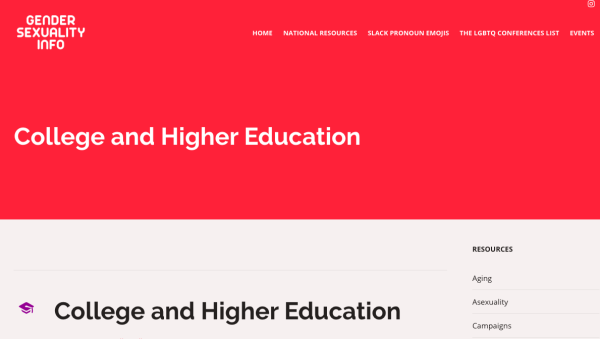 Find resources for LGBTQIA+ friendly colleges, scholarships, resources, advice and more. 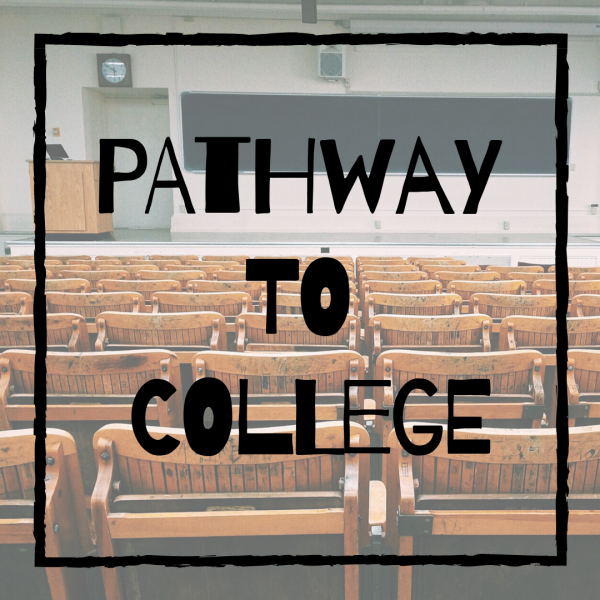 Evaluating potential colleges is a thrilling and sometimes nerve-wracking experience for most students. It’s exciting to select a major, explore different campuses, and contemplate your first taste of independence—but the process can also be a little scary, particularly if you self-identify as lesbian, gay, bisexual, transgender, queer or questioning (LGBTQ). While a 2013 study conducted by the Pew Research Institute reported that 92% of LGBTQ adults feel more accepted now than they have in the last decade, the stigma of non-heterosexual orientation endures, and it’s natural to feel apprehensive before moving into a new environment.